I will be purchasing my batteries from supersport600 as i've have good service with the fella. LG's HG2's are all I use these days, 50 watt's all day and I vape a fair bit. Those batts (chocolates) serve me well, I also use Supersports600 and always happy with the service and authenticity. rodbam and Sublime like this. The sony vtc6 perform slightly better when brand new, but over weeks and months the 30q has more longevity, so a 3 month old 30q will out perform a 3 month old vtc6. Both outdo the lg browns in both respects. I've got VTC5 and VTC5a, and if I knew then what I know now, I would have got all VTC5a. Seem to be holding up better, even after getting a lot more and harder use. Never used anything else, no plans to do so either. DogMan and fridgemagnet like this. Stay with the Samsung 30Q. It's a large capacity 15 amp battery that Mooch says can handle 20 amps. If you are running super low ohms and very high watts then the Sony VTC 5A would be the go. Mooch rates that one at 25 amps constant current. For me, the 30Q's are the best. Do the numbers and work out how many amps your batteries have to supply for how you vape, then decide. The trade-off with extra high current batteries is less capacity. Typically though, you'd need to be running very high wattages indeed on multi cell mods. I only vape under 12w with from 1.3ohm to 1.8ohm coils what highish MaH batteries would suit me? I have a couple of 3000Mah mnke batteries but they don't seem to last any longer than my 2500 Mah batteries. Definitely the 30Q's. The 3000 mAh is real, and at the power you use themyou will get all of it too. As a bonus, since you will never be heating the batteries up even slightly, then should last a lot of years. 30Q's are good because the internal resistance is very low, so they don't get warm when you are using them. This adds up to the things above - good capacity, not much voltage sag, long lifetime (more cycles) if you use them modestly. rodbam and emu like this. Sorry, but having both 30Q's and the LG's, i can tell you that the LG's sag something fierce towards the lower end of their capacity, and im only using them on temp control. 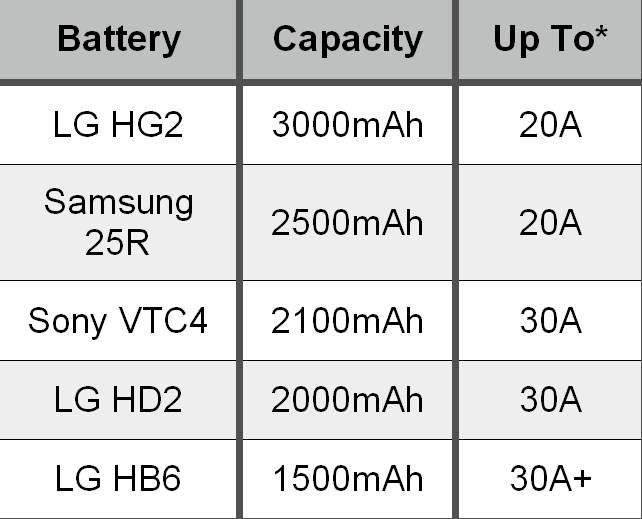 See this post from moi from earlier in the year: Which battery lasts longer...Sony VTC6, Samsung 30Q or LG HG2? Last edited by stylemessiah; 21-10-17 at 11:54 PM. DogMan, rodbam and DocM like this. gtadmin, Fatman, fabricator4 and 3 others like this.